Bill Nye @TheScienceGuy and Al Gore, 'not even wrong' on CO2 'Climate 101' experiment according to paper published in AIP Journal | Watts Up With That? From the department of “I told you so and I have an experiment that precedes this to prove it” comes a paper that proves Bill Nye’s faked ‘greenhouse effect’ experiment is also based on the wrong ‘basic physics’. Remember when I ripped Bill and Al a new one, exposing not only their video fakery, but the fact that experiment fails and could never work? Well, somebody wrote a paper on it and took these two clowns to task. Not only did the authors find that addition of the non-greenhouse gas Argon had similar heating effects to CO2, the Argon control actually heated up slightly more than in the greenhouse gas CO2 experiment, definitively proving that such experiments assume the wrong “basic physics” of radiation were responsible for the heating observed, instead of the limitation of convection due to CO2 having a greater density compared to air. Nye’s experiment not only limits convection by addition of denser CO2, it completely eliminates convection by enclosing the CO2 in a bottle with the top on. Thus, Nye’s experiment, in addition to the video fakery and incompetence, is not even wrong on the “basic physics” of the greenhouse effect. Classroom experiments that purport to demonstrate the role of carbon dioxide’s far-infrared absorption in global climate change are more subtle than is commonly appreciated. We show, using both experimental results and theoretical analysis, that one such experiment demonstrates an entirely different phenomenon: The greater density of carbon dioxide compared to air reduces heat transfer by suppressing convective mixing with the ambient air. Other related experiments are subject to similar concerns. Argon, which has a density close to that of carbon dioxide but no infrared absorption, provides a valuable experimental control for separating radiative from convective effects. A simple analytical model for estimating the magnitude of the radiative greenhouse effect is presented, and the effect is shown to be very small for most tabletop experiments. August 10, 2014 in Al Gore, Bad science. Well this expose is also gobbledegook. Why can’t these charlatans get it through there thick heads that heat lamps are maybe 1,000 Kelvin, and radiate at 3 microns wavelength, 100 times the radiance of the earth’s 10.1 micron 288 K LWIR emissions (that run the GHG scam. And a light bulb runs at 3,000 K and radiates at 1 micron, not 10, so it is 10,000 times the radiance of the earth. and 1 or 3 micron photons are much more energetic than 10.1 micron photons, about 10 times and 3 times respectively. If you are going to do the Bill Ny experiment, you have to use a thermal radiator, that is at 288 K; like a 16 ounce bottle of water that has been chilled in the frig. That will radiate about 390 W/m^2 of 10.1 micron radiation. So try that Bill Nye; you meat head ! It is hard to square “Right result” as a product of video fakery. A 3,000 kelvin light bulb is at half of the sun BB Temperature, so it is radiating at one sixteenth of the radiance of the surface of the sun. That will cook EVERYTHING in you glass bottle. They present like the middle ages (historical) alchemists, trying to turn lead into gold? But it’s not about the science. Millions of people actually BELIEVE that Bill Nye and/or Al Gore demonstrated “global warming” on live TV. That is what counts. Anyone else is funded by the Koch brothers and eats kittens. They are nuts, CO2 is a small part of our atmosphere, how can they justify their experiment? This might be tragic if at least Gore still believed what Gore says. Does this make any donations received by those motivated to contribute after watching that demonstration, now proceeds from deceptive practices? Well now that it’s officially shown the faked-up experiment had the radiative physics all wrong, the floor shall now be opened to the twenty or so regular whackos who insist the scientifically-proven radiative physics are just made-up bunk that violates the real laws of physics thus the experiment would never have worked even if it was real. Release the (barking mad) hounds! Although it is satisfying to read such a damning critique of the “experiment” it is disappointing that the authors gave Gore and Nye even the small amount of credit that they do (i.e. that it was an honest mistake) when in fact Anthony Watts has shown so clearly that this was a fraud from beginning to end. By the way, Anthony, that original critique that you wrote was one of the first things that I read here, and I often quote it to illustrate how a real scientist works. It stands in judgement against Gore and Nye. Even more damning was Nye’s subsequent dismissal of your critique as irrelevant – a real scientist would have been appalled. I should be used to it by now, but it still shocks me. The ever dishonest Pope Gore will try to claim he was still right about CO2, but for the wrong reason. And the sad part, most of his congregation are too stupid to know better. They should repeat the “experiment” – one container @300ppmv CO2, the other @400ppmv CO2. I could be wrong but isn’t CO2 a cheaper gas than argon to put between double insulted glass to lessen the conduction from pane to pane? Slightly off topic but I have done some unintentional experiments this week. It has been bloody cold and there have been some very frosty mornings. The temperatures have dropped to -3 C and the surface temperatures to -7 C. The differences can be up to 5 C or 10 F over two metres (just short of 7 feet). 5 C warmer 2 metres away seems to be less effective than 50 C cooler 10 km away. (15°C * 9/5) + 32 = 59°F. Dang, I can get water at the tap colder than that. Check that fridge, you’re seriously risking food poisoning! The paper was published in AJP in 2010 (submitted July 2009), which seems to predate the Gore/Nye demo. Neither Gore nor Nye are mentioned. Well that’s nice. Ye I know the experiment is wrong but it is not about being wright but scaring the crap out kids pants and a nice job they do. The fun thing is that although its wrong there is a nice way it fires bag. We have two bottles one whit normal 100% air and one whit 100% CO2. Now look at the temperature difference, maybe they not done at that point but I see a 2 degrees C temperature rice more whit CO2. OK CO2 makes it hot but thats 100% CO2. That makes 1% CO2 0,02 degrees C warming but in the air is only 0,39% CO2 that would make a warming of say 0,000078 degrees. Not rely that much of global warming. But it is human admitted CO2 and that is only 4% of the total so how many degrees do humans get the earth warmer? You could say NON. Mad is not my strong thing to do but even so you cane calculate it one your own and get similar results. Well imagine all those so called scientists and climate mongers admitting they are wrong? Gripes, no way Jose, it is my job at stake! There is always and alternative opinion they say. This might OK in some disciplines like archaeology and history, but when it comes to Physics it belongs to the nature and order of things, or laws. And they haven’t got one law right yet? Invented their own as a strange and false hypothesis. And unfortunately the majority who support their hypotheses haven’t a clue, so they go along with the ride. I just put two of them in a cool bag for travelling. I hope there’s no CO2 in the bag – otherwise I’ll have thermal runaway. Simple experiments like this destroy aspects of elegant but wrong climate science. Far more of these simple experiments are required before nonsense is built into climate models. Its a pity that the authors had to say that this paper in no way undermines IPCC science . Galileo had the same problem with the Jesuits. Aphan @ 10:41 — Please note that there is a link there that you should have followed. Go do that. If folks would listen to me – no one does – this would be called the “atmospheric effect” and anyone using the term greenhouse when not talking about growing plants would be buried in 1,000 pounds of cooked spaghetti. 100% CO2 is Freezing Cold Dry Ice. In the experiment shown in the video, the glass jars are closed. There’s no convective cooling taking place. “CO2 reduces convective mixing with ambient air because it is heavier than air” is not a valid explanation in this case. The jar is full of CO2 and it does not mix with air. Moreover, light bulbs are used for radiant heating. The tungsten filament in light bulbs is at over 2,000 C temperature. It emits light and shortwave IR < 3 um. This is like the sun’s radiation. CO2 absorbs longwave IR centered at 15 um. So they cannot show “greenhouse effect” in this experiment even in principle. I suspect the temperature difference between jar with air and jar with CO2 is the gas is hotter than air. Why? Because CO2 is pumped to the jar. Pumping increases pressure and that also increases temperature. CO2 must be at higher pressure than atmospheric pressure to force the air out of the jar. It would take some time for the heat to transfer from gas to thermometer so it appears the light is heating the gas. Actually the light is heating the thermometer because glass can partly absorb light and SWIR. Al Gore’s Climate “Reality” : the reality is that it’s a lie. A very successful one. But how do you put it in the cylinder in the first place? By pumping it. That heats it. When released it will cool. But cooler than ambient air? No. Because you’re putting it in another container. It has to force air out of that container. Their biased data and the resulting misleading pronouncements are all they need for graphic, simplistic, MSM messages. Once the Press Releases are distributed, the genie is out of the bottle and the PR message-right or wrong- has gone viral. An interesting point, does the increase of co2 in a bottle increase pressure , though slight , to show an increase in temp. But surely, the warming due to GHG is accepted, by just about everyone: it is the positive feedback/water vapour effect that is disputed. So any such experiment is unnecessary anyway. BTW the light can heat the glass jar and the glass emits LWIR that CO2 can absorb. They might be able to detect it but they should isolate other possible causes of heating. The paper mentions neither Gore, Nye nor their faked experiment. So it is rather mislead say someone “took them to task”. As Nick noted, the paper was published before the video was done. With a little thought you could have noticed that the paper predating the “faked experiment” of Gore and Nye makes their “experiment” even more egregious. Blast! I activated one of those ridiculous stars by accident! In late 2009 when Climategate broke, the BBC endeavoured to shore up the science and basic physics upon which AGW is based. It ran the bottle experiment as proof of the soundiness of AGW. To any scientist, it was obvious that the demonstartion/experiment was fundamentally flawed. But it did the trick of deceiving the public (there was a live studio audience who were all very impressed by the experiment). That, of course, was the reason why it was given air time, and presented on prime time TV. Regretably, scientific integrity is very low down on the scale. This will come back to haunt, since it only takes a moment of madness to lose trust, and once lost, it is difficult to regain. The public will react harshly as the deception is revealed and the price that they have been forced to pay becomes apparent all based upon dodgy science (particularly the modelling and their projections) and the over blown extrapolations. This has always been my gripe about the experiment. One jar contains air, the other pumped full of CO2. First off, to prove anything, the concentration of CO2 should be representative of the current atmosphere at 400ppm. If that does not warm, then what is the point of “pure” CO2, that concentration will never exist in nature. I saw that at the time…”uncontrolled” came straight to mind. Plus the ex Scientific Advisor BS which revealed his total arrogance. He appeared to be very angry? I emailed a complaint to the BBC…long response about the lovely journo presenter. Lick ar*e mainly. kept returning 404 Page not found. above but direct access to the link is being filtered and denied. “In late 2009 when Climategate broke, the BBC endeavoured to shore up the science and basic physics upon which AGW is based. Well, this paper predates even that. Well, it doesn’t say anything about Gore/Nye. And it is a different configuration. Wagoner et al had a thermometer at the bottom, and said the warming was due to density stratification stabilizing a temperature gradient making the temperature hotter at the bottom than the top. That wasn’t the arrangement in Gore/Nye. An angel was guiding your finger. Nick Stokes, are you claiming that the Al Gore, Bill Nye experiment is an accurate representation of the AGW CO2 effect? I know that you don’t, so why the misdirection? Good grief, man! Please try to get a grip on reality. There were a series of fake ‘global warming in a bottle demonstrations’. Trivial differences between the demonstrations don’t alter the fact that the paper predating them explains they are fakes. It is the fakery which matters and NOT minor differences between the fakes. I’m still looking for a class room experiment demonstrating CO2 induced radiative warming of the surface of a rotating water planet with clouds, lit from just one side, floating in cold space. I’m afraid the case is not made that this is even happening in reality. So far my best analogy of the CO2 effect is this: Imagine a clear night. You stand with your car on a cliff with your headlights on. You see nothing, not even that the lights are on. Then comes some fog. The more fog, the more you see the reflected light of your headlights. What if … I were to build a ~15ft long insulated and sealed box, (aluminum foiled isocyanate board) and positioned it vertically with an LIR emitter simulating warm dirt, (plate of rusty metal heated to say 200 degrees F) inside at the top. I think having the heat at the top would eliminate convective action. At the bottom end have window (made of salt or is there a more practical material?) to allow the IR out and pointed at a consistently cool black body surface on the floor. Instead of argon, just compare ordinary air against the same with a lot more CO2. Measure the gas temperature at the top and bottom over time, regulate the emitter to stay at the same temperature continuously. According to GHG theory the one with more CO2 should have a higher gas temperature at the top compared to the one with plain air. (I’m really not certain what to expect as a difference at the bottom?) Say the difference in concentration was 256X ( an 8X doubling = ~ 10% concentration) versus normal air. Would the expected amount of difference in the top gas temperature per GHG theory be large enough to measure with ordinary temperature sensors? I’m not a fan of these experiments. They don’t tell us anything new about the radiative properties of CO2, which have been known since Tyndall. And they don’t show what happens in the atmosphere, where there is a multi-km scale and a vital interaction with the lapse rate. You can’t show that in a bottle. But whatever the faults of the Gore/Nye demo, this Wagoner paper isn’t telling us anything new about them. That’s scatter, not absorption and re-emission. Yes. This is 4 year old news, right? Agreed, the video was a frawd [moderation} and that was clearly demonstrated. This paper does not add to that. mikeishere, no the temperature difference would not be large enough to measure, with even the most accurate temperature sensors, because the error range is much larger than what is being measured. Of course. But isn’t it a good analogy? The satellite images in the 15 micron band look foggy, don’t they? Most criticisers of skeptics, usually the ones who user the derogatory term “denier”, think that the sceptics dont believe the physics and feel the need to demonstrate it. My observations are that they also feel smug in “knowing” this scientifically trivial knowledge and have no idea of the real issues. Bill Nye is a TV clown who dresses like “mad scientist” to entertain children. He probably even imagined it would work. When he couldn’t get the “right” result, Gore paid someone to do some post production editing and fix the problem. The way it was constructed anyone who knows basic physics could have told them it would not work. They could have known it would not work, but that was not of interest. It was a PR game. Egregious or not that does not counter the point of my comment that you chose not to quote. Greg, in case you are curious the surface temp is 30.8˚C this morning, we got a light breeze that cooled it off. The sky is still mixed clear and cloudy. Bottom line to all of this is that I have never observed the surface skin temperature rising due to increased cloud coverage, and it should rise pretty dramatically with an extra 130 watts hitting it. Such misdirection is usually only practiced by illusionists. But you and Nick Stokes are trying to present it here. There were several fake demonstrations of ‘global warming in a bottle’. One was the Gore/Nye demonstration and our host provided an assessment of their demonstration. Remember when I ripped Bill and Al a new one, exposing not only their video fakery, but the fact that experiment fails and could never work? Well, somebody wrote a paper on it and took these two clowns to task. Oh dear, the incompetent & faked attempt by Bill Nye to demonstrate the greenhouse effect for Al Gore’s Climate “Reality” Project has also been shown by a peer-reviewed paper to be based upon the wrong “basic physics” as well. So, the paper adds to our hosts exposure of “Bill and Al” having provided “video fakery”. The addition is to show that the “video fakery” was used to ‘demonstrate’ “the wrong “basic physics” “. Also, the paper takes everyone – including Nye and Gore – to task if they provide such “wrong “basic physics” “. And Nye and Gore did provide it after the paper had been published. I did quote your post and I commented on your point I quoted. Didn’t that one fail already by Arrhenius’s (and sciens at that time) insuffient knowledge of the infrared opasity capasities of the saltstoneprism used in his experiments?? His calculations went wrong assuming the prism was fully transparent to the IR wavelengts he measured… it was NOT!!! Another instance of “fake but accurate”: a case study in confirmation bias. Bill Nye and AlGore foist a “proof” of Global Warming’s key mechanism on the rubes, but the underlying physics of the experimental setup is shown to be flawed. But, but, but Gore is the only person protecting us from the dangerous heat of the Earth’s fiery million degree interior! And Bill Nye is America’s science future. And people like him! He can’t be wrong. Could I request that you get rid of the ‘likes’, which have appeared recently. They are pointless, silly, and should have no place on a serious science blog. This is not Facebook, thank goodness. Surely, the only reasonable way to rate a post is to write a suitable reply. Just out of interest, what do you think was the purpose of the Gore / Nye experiment? The whole thing was absurd. First of all, the atmospheric increase in co2 in the past 100 years has been 1 molecule out of 10000 molecules, from 3 to 4 in a constantly changing uncontrolled environment. The closed container and pumping in what is a much much much greater amount had no chance of replicating the real world and was as usual a propaganda piece. The fact still remains that the effect of co2 is so small that the whole argument is like theologians arguing over how many angels they can stick on the head of the needle. The CO2 gets hotter because CO2 is a good adsorber of IR radiation. But just letting it get hot is only half the experiment. The CO2 will cool faster because it is a good emitter of IR. To act as a GHG you need a poor emitter, like Oxygen or Nitrogen. Comments from the readers are worth reading too. This guy Nick Stokes seems to think that because the paper was written in 2010, that Bill Nye and Al Gore get a free pass. In my book, it makes them even more culpable. Because they didn’t bother to research their “experiment” ahead of time. The video fakery is proof positive that not only are they clowns, but evil ones too. Stokes can’t even bring himself to criticize them. That right there is what is wrong with science today. Anthony, you said “not even wrong” instead of “not even right” on basic physics in your conclusion. There is a phrase in physics, “not even wrong”, attributed to Wolfgang Pauli (quantum exclusion principle), that is a shortened form of a criticism he had for an especially bad paper … “It is not only not right, is is not even wrong!”, meaning that the paper is so far off the mark that it is clear that the authors do not even understand the nature of the problem at hand, or have set out to demonstrate a logical fallacy, or to gain a “correct” conclusion by arguing from premises we know to be wrong. I would tend to lump most of what passes for Climate Science into the “not even wrong” category because it is based on premises we know to be wrong, are not supported by any experimental evidence outside the margin of error, or what little evidence does exist outright contradicts the theory. And you have to be careful when you read contributed comments, as they are sometimes “not even wrong”. Take for instance the above comment by Nick Stokes … ‘I’m not a fan of these experiments. They don’t tell us anything new about the radiative properties of CO2, which have been known since Tyndall. And they don’t show what happens in the atmosphere, where there is a multi-km scale and a vital interaction with the lapse rate. You can’t show that in a bottle.” …. which on it’s surface sounds like he is arguing from well established green house gas theory and complaining that you cannot stuff that effect into an experiment that fits inside a bottle. The trouble is, when experimentalist go looking for his “vital interaction with the lapse rate”, they find no evidence of a hot spot in the upper atmosphere as theory demands. Where is the evidence? If there is no evidence, then the theory must be wrong. Wolfgang Pauli would have trashed all such arguments of factually unsupported theory as “not even wrong”, perhaps with a giant sign and a double face-palm for recognizing how far the “science” has fallen. I would hesitate to call your desire for a correction of “not even wrong” to “not even right” an example of “not even wrong”; rather a lack of context to understand the irony. (^_^) But now you understand; and this is what I like so much about WUWT … we get to learn about things that we might otherwise never get exposed to. You use it to refer to someone who just doesn’t get it. I agree with Chris Wright says: August 11, 2014 at 4:38 am. I recall this experiment about 2 years ago, and I recall that the majority of regular commentators who passed comment on the like function considered it to be a bad idea. Because of that feedback, Anthony got rid of it. A drop of about half a degree is quite typical. The diurnal range is very small due to the huge heat capacity of the ocean, and subject to wind, the rate of evaporation is not so different day or night. . In late 2009 someone suggested I look at an NOAA page describing this Gore/Nye experiment. This page had been online since at least 2005. The NOAA page describes not a real experiment, but an absurd endeavor and to demonstrate so I had a class of physics students recreate it. All sorts of outcomes are possible because noise dominates the whole project. WUWT at the time linked to my brief report about our version of the experiment. In principle the experiment could show the effect that GORE/NYE/NOAA/BBC all intended to show. The thermometer embedded in a bottle of CO2 reaches an equilibrium temperature by absorbing SW radiation from the lamp and emitting LW radiation from its surface in addition to convection. As any mechanical engineer can attest CO2 will influence radiative transfer in enclosures like furnaces and boilers, and should also then in a plastic bottle. However the bottle is so limited in size that the actual experiment becomes dominates by other influences and is a silly exercise in scientism. It has to be faked to get the expected results. Darn. “S” is next to “d” on a keyboard and so “dominates” should have been “dominated” in my prior post. If Bill Nye wanted us to hunt deer then here is the experiment he would do. He’d get a 10 ft x 10 ft pen and place one deer in it and show how it can move around freely, then in the pen next to it he would jam in as many deer as he could and say look they can’t even move. Bill Nye the propaganda guy would then say ‘this is why we must hunt deer because if we don’t they will overpopulate the earth and it will be catastrophic for all living thigs to move.’ Then we’d get Nick Stokes on here telling us how Nye’s experiment was different than other deer experiments and therefore not discredited. In that budget/cartoon, all reflected solar goes directly out to space. But we know that that does not happen. Some of this is re-reflected back to the surface from the underside of clouds (thats why it is light before sun up, and why it is not pitch black even when very dark rain filled clouds pass overhead; there is scatter and re-reflection). . Approximately one quarter of incoming solar is reflected off the top of clouds and goes back up to space, one would therefore expect to see a broadly similar amount of reflected from surface solar being re-reflected from the underside of clouds back to the surface. Whilst the figure involved about 7w/msq is not large, failing to take this into account, means that the budget does not balance! When a budget does not balance, there are problems! Do you do this for exercise, or is there some point worth noting behind the distinction you’re making? Such propaganda seems to migrate to schools more often than to other parts of society. I suppose the activist preachers are also free of revision in that process. Only the next round of innocent victims get a chance at message reform or replacement, if any. Nick Stokes, one of the apologist blokes. It makes you wonder how Mao’s Cultural Revolution was presented to young children in schools at the time. It took at least one generation for that social science policy fad to pass out of favor. And without official sanction for any criticism for it or Tienanmen Square, families are left with slow generational adjustment in place of apologies. It is a measure of party power and control. In other areas of science faking the results of an experiment would be a scandal and the author’s reputations would be ruined but in climate science this behavior seems to be acceptable. That’s something I don’t understand. No way! Wrong Way Nye? The same guy who has the trade winds blowing from West to East (with a fan sitting just off the map in what would be the Pacific Ocean blowing towards California)? That guy? No way! Others have given the background for the phrase but I though I might have a go at giving a “not even wrong” example. I postulate that the moon takes on a yellow tinge on nights where the sunlight reflects off the cheese at a particular angle. If I were to take two bell jars and fill one with air and the other with CO2 and then proceed to add heat at the same rate to each; I would see the CO2 warm faster due to it’s having a specific heat of about .8. That is because we have to many Teachers who do not have the Intelligence and the Education to be instructing. Our failed Education is self replicating. Which is even more damning because they were wrong the moment they thought up the experiment. 😉 I think the paper written “on it” is about that type of experiment? It doesn’t really matter, they are wrong. In 1896 Arrhenius estimated that a halving of CO2 would decrease temperatures by 4-5°C and a doubling of CO2 would cause a temperature rise of 5-6°C. In his 1906 publication Arrhenius adjusted this value down to 1.6°C (including water vapor feedback: 2.1°C). Recent estimates from IPCC (2007) say this value (the Climate Sensitivity) is likely to be between 2 and 4.5°C. But Sherwood Idso in 1998 calculated the Climate Sensitivity to be 0.4°C, and more recently Richard Lindzen at 0.5°C. Roy Spencer calculated 1.3°C in 2011. You need to understand that Nick Stokes is a climate modeler. “It is difficult to get a man to criticize something if his salary depends upon his not criticizing it”. According to the AR4 report, the “likely equilibrium range of sensitivity” was 2.0 to 4.5°C per CO2 doubling. According to the newer AR5 report, it is 1.5 to 4.5°C, i.e., the likely equilibrium sensitivity is now known less accurately. But they write: “This assessment reflects improved understanding”. How ridiculous can you be? It is telling us they didn’t do their homework before performing a fraudulent demonstration. It is one of those “what we learn from history…” things. And probably 100,000 classrooms got the same demonstration from their teachers. We really should be measuring the energy in the system. Given a fake world with fake science wanting to believe in fairy tales with the white knights in shining armour charging to save the world who cares about facts and reputation. Ask Mann et al and a host of climatologists or bedfellows like Lewandowsky. Why worry about reputation when you have the Pres of USA, PM of the UK, the UN and a host of stuffy institutes and nations nodding in robotic unison. You can be part of the mob feted to greatness; just mouth the words “climate change.” If the bread on my table depended on it I guess I would be singing from the same song sheet too. Would anyone willingly jump off that band-waggon? Welcome to Alice and Wonderland. Science, now that is a pretty word; wonder what it means. In all this period I still don’t know what is the clear, falsifiable, repeatable, quantifiable hypothesis of CAGW. They have been at it for over 150 years; the Cheshire cat just disappears. That’s interesting. I would have thought that the carbon dioxide’s temperature would rise more slowly because its number of joules per mole per kelvin is almost half again that of air. What have I missed? It’s not even wrong because the results are correct, of course they were not demonstrating what they claimed to be demonstrating because they didn’t understand what they were actually doing, but that’s another story entirely and ought to be rather embarrassing to Nye since he claims to be a scientist …one could expect it of Gore because he’s a science incompetent. Argon’s mass heat capacity is about 0.5. The experiment used Ar as a comparison so it would make it even more confusing as both behaved similarly. No, it’s easy. The experiment is fake but the results are real is the underlying principle of the climate models. This all reminds me of the magic trick I used to do as a child balancing a pencil and by gently blowing on the pencil I could get it to move and point any direction i wanted it to. Get the NoScript plugin and just don’t give permission for this site to run scripts. Then there’s a different symbol, might be a flame, that doesn’t… Strange, they didn’t register a “like” for me before. But now that I did a test “like” with the script it now works without, maybe it set an identifying cookie. And if you block wp-dot-com then it doesn’t show the identities of the “likers” in the hover-thing. Good News, Richard! You can click on the star and “un-like” your previous “like”, it’s reversible. You can also “like” your own comments. Would you feel comfortable voting for yourself if you were running for public office? And now when I checked before posting, it shows you did test that feature on that comment. You do believe in democracy! This “experiment” is just bizarre. First off, Nye says the bottles are “sealed.” Then he unseals one and puts in a hose through which is flowing CO2 from a pressurized bottle. The CO2 will be cool due to the throttle effect, adiabatic pressure drop. The CO2 flow appears to be directed at the thermometer’s empty end. The “heat lamps” put out visible and near-infrared light, with a negligible amount of far-infrared 15-micron IR. The lamps heat the thermometers directly! This completely negates any CO2 active absorption/thermalization of 15-micron IR. Why one heats faster than the other is anyone’s guess but has nothing to do with the gases, as both air and CO2 are completely transparent to visible/near-infrared light. Most likely the bulb of one thermometer was directly above a dark-blue section of the little globes, and the bulb of the other thermometer was directly above a lighter-colored section of the globe. The dark-blue section of the globe would heat slightly faster from the heat lamps. The justification is simple and completely unrelated to CO2 in the real atmosphere. They are not examining the affects of CO2 in the real world; they are looking at the assumptions made by Nye in designing his experiment and in interpreting its results. What they say in metaphor is that Mr. Nye wandered onto the cricket pitch and attempted to explain the players behaviour using the rules of golf. The purpose of experimentation is to isolate a “known” – like CO2 – in a controlled environment with known properties – like a bottle – and subject it to a known force – like a heat lamp – or process and measure changes. Importantly, you use controls that cover variables – like mass – in order to isolate the distinct response of the material being studied. This something that computers and mathematical models are poor at. Nye failed to 1) properly estimate what the results should be using the appropriate physics, assuming his “hypothesis” was correct, 2) he failed to consider the behaviour of the experimental microenvironment and ITS effect upon the outcome. The only “right” outcome was that he (Nye) correctly predicted that exposing a bottle of gas to a heat lamp will warm the contents. But while he correctly “predicted” that CO2 would warm more than a normal air mix, he failed to account for the additional mass of CO2, which is considerably heavier than air. By using Argon as a control the new work demonstrated that mass and convection, facts known for over a century, but ignored by Nye, are critical in explaining the experimental outcome. It is worth remembering that Arrhenius – the “father” of the “Greenhouse Effect” – and Tyndal(?) upon whose work he relied were BOTH using “bad” phsyics to begin with. Tyndal had an excuse, but Arrhenius continued to be an advocate of the “lumniferous aether” into the 20th century, well after Michelson and Morley, who published in 1887. It was well known before WWI that Arrhenius phyics was wrong about how the greenhouse effect worked. In an earlier post I said faking experimental results was acceptable in climate science. That’s not true, I apologize, the majority of climate scientists are intelligent, hard working, honest and genuinely want to advance the science. It’s only a few bad apples that ruin it for everyone and this is an example of a couple of bad apples. The thermometers have to be shaded from the direct electro-magnetic (infra-red) radiation. It is not possible to just hold a thermometer in the sunshine and measure the temperature of the air – you need a “shade” temperature – that’s why a “Stevensons screen” is used to shield against heat radiation from outside of the shelter corrupting the measurement. The headline is very confusing. Makes it sound as if the critique of the Nye experiment validates that experiment. Is it “not right” or “not wrong”? that you cannot assess the nett effect of more CO2 in the air with a closed box experiment. as the argon experiment clearly shows. Question: why is nobody teaching this? At the fan rep, the big globe is going the right way in case we get comments. Among other things, I’m a SCUBA diver. Air pumped into the tank heats it. I suppose if you were to immediately let it back out, yes it would return to ambient temperature. But that’s not what happens. WHILE the air is pressurized and hot, the tank is cooled in a water bath as otherwise it will get so hot as to weaken it (and then maybe explode). This removes heat energy. Releasing the pressure once the tank is cooled produces very cold air because the same amount of heat that occupies is now being spread out over a larger volume producing lower temperature. This is true also of carbon dioxide fire extinguishers, a trick is to blast your beer can with CO2 and it will chill it very cold very quickly. Needless to say keep your body parts away from the blast and any metal parts near the nozzle because you are shooting dry ice at about -110 F even when the steel bottle is at ambient temperature. This phenomenon also exists for propane tanks at ambient temperature. While operation, they get very cold at the valve and eventually can chill the tank itself, on a cold day already it can chill itself to the point where it just stops working. Your comment pertained to going from one container to another. Here’s a description of filling a paintball gun cylinder from a larger CO2 cylinder. Going from higher pressure to lower pressure chills the CO2 even though the lower pressure is still higher than ambient. SMS and others should pay attention to chemengrls. I and others have pointed this out before CO2 mass is 44.01 grams per mole but air is 28.9 grams per mole. Due to the mass of CO2 it cannot get as high a temperature as air give the same volume and Q (heat input). Any real physicist would have winced when they watched that childish “experiment” – then bit their tongues. “Useful idiots” after all. The real tragedy is not the idiocy of Messrs Nye and Gore, it’s the silent complicity of corrupted or fearful scientists. The casual blogger should remember that shortwave IR such as solar, and “longwave” IR emitted from “terrestrial” objects have very different real world properties. No, it is not. The work is not about “climate” or determining anything remotely related to climate. Their methodology, rational and conclusions say nothing about climate. The work is an experimental critique of Nye and his experimental methods and physical interpretation. The only value the authors find in Nye’s work is as an example of bad experimenbtal design. Not everything is about climate. Nye’s work is replicated and found not just inadequate but wrong by the authors. Known since Tyndall? Tyndall speculated that CO2 caused warming in the atmosphere. Arrhenius hypothesized based on his faulty experimentation. Experimental evidence since has shown that both were wrong. The difference between speculation, hypothesis and experimental fact appears to escape you completely in favour of “the inerrancy of certain scientists”. It is a fallacy, of course. It isn’t new work. But you’ve misunderstood it. The mass of gas only affects the heating time, whereas these experiments seem to have settled down to steady state. Wagoner et al attribute their effect to a density stratification, which allows a temperature gradient (and differential) which would otherwise dissipate with convection. But that is a pretty special circumstance. It requires that the thermometer be at the bottom. It requires that both air and CO2 (or Ar) be present; if it’s all CO2, there is no gradient. And it would require that the CO2 be introduced carefully, without mixing. No, he didn’t. Nowhere. He simply measured the IR absorption characteristics of CO2 and other gases. And those measurements of physical properties have held up very well. Shouldn’t the CO2-rich mix take longer exposure to IR heat to warm up and take longer to cool down? Not to mention the obvious fact that it doesn’t really matter in the face of diurnal effects, starting temperature, pressure, etc. seen in the real world. I haven’t read all the comments but I think that I might have had a hand in this. I have been very active on the internets pointing out the existence of the 2010 paper whenever someone brings up the CO2 in a bottle experiment. I believe that Dr. Spencer has also chimed in on these worthless experiments pointing out that CO2’s radiative properties are both a function of concentration and distance. At such short distances it is simply impossible to measure the greenhouse gas effect of CO2 with a thermometer. Even in major controlled laboratory experiments using long distances it takes extremely accurate instrumentation to measure the actual GHG effect of CO2. You keep saying that Arrhenius actually measured CO2s IR effect. To my knowledge he did not. He calculated it using Stefan-boltzman. Actually measuring CO2s IR in a laboratory experiment is even difficult today with highly accurate instrumentation. Well Duster; just where in MY post did YOU read anything about climate ; because I never mentioned anything to do with climate. And where in THEIR ESSAY did YOU read anything that they said about Bill Nye’s experiment using totally phony, and illegitimate EM radiation sources, that don’t in your wildest imagination, approximate the actual earth radiation source, that is alleged to cause all this atmospheric heating. I’m not disputing anything that happens in the atmosphere. Just what happens in Nye’s experiment, that is the true cause of his error. And THEIR explanation, has nothing to do with the real error, which clearly THEY don’t understand either; and evidently neither do you..
Running over a Brazil nut with an Abrams tank, is not a good way to demonstrate that you can peel one with your teeth; at least use something approximating your teeth; like a nutcracker, or tongs. I said earlier that I think these demonstrations are of limited value, in that scale (km) and lapse rate are a vital part, and can’t be done in a bottle. But they do put some things in proportion. Joe Bastardi above says that we have only gone from about 3 in 10000 to 4 in 10000. Another way to put that is that the amount of CO2 that IR has to get through to escape Earth is equivalent to about 2.8 m of 100% CO2 at surface pressure. It used to be 2 m. So showing that, on that scale, even a few cm of CO2 interact significantly with IR can help. Where? I said Tyndall measured absorptivity. Well good for you Dirk. I predict a null experiment; whatever that is. The water will be good, even when it is not frigged. So, does anybody have a copy of this paywalled paper? Or, you could go out into the middle of a very dry desert close to the equator, and measure the rate at which a thin slab of e.g. copper that is painted as perfectly black (emissivity 1) as possible on top and insulated by a vacuum and perfectly reflective shield on the sides and the bottom, held at the bottom of a convective trap but fully exposed to the night sky cools, on average, correcting for the ambient temperature of the air in the convective trap, every clear night that the humidity remains below (say) 10% in a few hundred different locations, for ten years. That would suffice to demonstrate two things. First, that atmospheric CO_2 isn’t enough to stop the copper from cooling to the freezing point most nights from any reasonable starting temperature — well-mixed CO_2 may slow radiative transfer of heat, but it doesn’t slow it by much as long as the ground layer is sufficiently conductive that the heat continues to radiate away in the unblocked wavelengths. Second, over a decade, atmospheric CO_2 will increase by at least 10 to 20 ppm. Over a decade, one would accumulate tens of thousands of samples of radiative cooling rates, with hundreds or even thousands available for any given set of initial and final conditions and deciles of CO_2 concentration in the range. One could, under those circumstances, make a stab at directly measuring the effect of additional CO_2 on cooling rates and controlling for confounding heat flow in the other available channels. Indeed, it’s a shame that they didn’t start an experiment like this a decade ago, because if they had much of the discussion would be moot. The direct experimental observation of the marginal modification of the total radiative resistance in an environment where CO_2 is the dominant/only source of radiation absorptivity in the LWIR band would be enormously valuable, as now it is basically an unknown set from one of several approximate models with some user-controllable parameters that cannot really be directly verified, at least according to A First Course in Atmospheric Radiation, which is why its influence is usually given (as it is above) by a rather wide range, and without any sort of additional nonlinear modulation or feedbacks from the other GHGs, even ones that overlap their absorption bands where one is CERTAIN that the “bare” logarithmic dependence of both in Beer-Lambert is strongly suppressed (because saturated is saturated). Nick Stokes is absolutely right to point out that the paper preceded the false experiment, because Hockey Schtick’s writeup takes the tack that the paper was in response to that experiment and had messages for Gore & Nye — when it clearly did not. Good for Nick (this time). Six of one half a dozen of the other. I’m saying that Arrhenius did not make any such measurement of what ever you want to call it. Such a measurement is difficult even today with the most advanced instrumentation. Arrhenius made a calculation using stefan-boltzman. There was no experiment to my knowledge. OK, now you are saying things that are just plain wrong once again. If you look up e.g. the single layer model in Grant Petty’s book — I recall somewhere in chapter 6 — and consider the fact that 2 meters of 100% CO_2 at surface pressure is 100% opaque to LWIR in its absorption bands, 2.8 meters is still — yes, 100% opaque to LWIR. The mean free path at the current concentration is order of a few meters. At 100%, it would be a few millimeters. The marginal change in surface warming would be zero. And this is just in a single layer model with no lapse rate, as I very much doubt that you could sustain a lapse rate across 3 meters sufficient to get the differential cooling that is supposedly important in the actual atmospheric radiative effect (a better name than greenhouse effect). The CO_2 would still be at basically the same temperature as the surface where it radiates through the presumably transparent atmosphere above — a layer of CO_2 on the ground like this would probably COOL the planet substantially relative to a well-mixed atmosphere because of the lack of a lapse rate at the scale height where the atmosphere becomes transparent. If all you are trying to say is that CO_2 is a strong absorber of LWIR in its absorption band, this doesn’t really need to be “shown”, but sure, if anybody is in doubt there is plenty of spectroscopy that says otherwise, including multiple figures in Petty’s book. I don’t know what knowing this “helps”, though. The nuts don’t even understand the single layer model, the non-nuts understand that the atmospheric radiative effect is complex, not simple, and perhaps isn’t even fully understood (in at least the sense that we cannot precisely compute it even when we try very hard and with the best of intentions and tools). Otherwise, putting a mirror on top of a heated house to reflect heat back down that is twice as thick isn’t going to make much of a change in temperature, is it? The point is that it is already a mirror. The lapse rate is an essential component of the expected variation of the atmospheric radiative effect with marginal variation of well-mixed CO_2 concentration, which is one place things get very complicated as the lapse rate is maintained by a mix of tropospheric convection, radiation, and the radiative and convective properties of the stratosphere and it isn’t clear that varying CO_2 concentration in atmosphere that is already many, many mean free paths thick without varying the temperature at the height where it becomes approximately transparent (in in-band LWIR) will have any effect at all. Or did I completely misunderstand your point? I’m actually quite sure that Nick Stokes is wrong. Arrhenius explicitly states that he cannot perform such an experiment as it was then presently impossible for him conduct. ??? It was my understanding that he actually has a degree or two in physics and a fairly extensive list of publications. He may also be a computer geek but then — so am I. So are a lot of people. We sometimes call them “computational physicists”, but in truth, if you are a theorist you sooner or later need to do a computation and most computations these days cannot be done analytically so many, but not all, theorists get to be pretty good programmers. I do wish that people would stop banging on Nick (and for that matter Mosher) ad hominem. He is unfailingly civil — even more so than Lief, who long since lost his patience if not his temper with complete idiocy — and is rather knowledgeable about the topics of discussion and AFAICT generally competent in physics. I don’t always agree with him, but so what? I’ve been wrong (and he’s corrected me) several times in the past that I can recall, and perhaps I may have corrected him once or twice, perhaps not. This is a hard subject; it’s difficult to be right all of the time no matter how smart or well-educated you are, and one’s perception depends on lots of things — trust in other people’s work, knowledge of statistics, knowledge of large scale modeling in general, knowledge of fluid dynamics in particular, and because it isn’t really computable (in MY opinion) a lot of the discussion ends up being about not the actual microscopic dynamics but about various linearizations and simplifications that are actually arguable as they aren’t “laws of physics” and that may or may not actually hold. So please, let’s maintain a tiny bit of respect. If you have a specific place where you think Nick says something that is not true or that is arguable, by all means say so and advance your counterargument. Logical fallacies such as ad hominem won’t improve your argument, however, they just (in MY opinion) indicate its probable weakness. The more you have to say about your opponent, the less you have to say about the matter at hand, or what your opponent says. Joe Bastardi said 1 molecule in 10000 couldn’t have an effect. I said it might be useful to have an experiment showing that on a cm scale, 100% CO2 would have a significant effect. You’re saying it blocks completely. Well, that’s a significant effect. The argument about saturation goes back to Arrhenius vs Knut Ångström. It was eventually resolved with better measurement (Plass etc, 1950s) in Arrhenius’ favor. But yes, you can’t demonstrate all that with an IR lamp. The quantum mechanics of CO_2’s electronic structure and its rotational-vibrational structure is reasonably well-understood, well measured, and reduced to spectrographic photographs at this point. It can be at least approximately computed with various tools, and while the computations are indeed approximate, they are certainly qualitatively correct in addition to being within spitting distance of quantitative measurements. and so on. There is quite literally no doubt about any of this stuff in general, although if you go get yourself a physics Ph.D. and spend a few years doing atomic or molecular spectroscopy you might qualify yourself to argue about specifics in some particular circumstance. The modern understanding of the GHE is a bit more involved than the 19th century, pre-quantum-theory explanations and arguments, so you are beating a very dead horse (or straw man, or red herring, or one of those things) if you resurrect them to beat on them some more. A good starting point would be Grant Petty’s book, A First Course in Atmospheric Radiation, which you can probably appreciate if you have at least a minor in University level physics, ideally one that includes a course each in E&M and Quantum mechanics (and it wouldn’t hurt if a third one were in thermodynamics). A bachelor’s degree in physics would be even better. In the meantime, arguing about the hand waving arguments from the 19th century measurements and theories with more argumentative hand waving is basically waving bye-bye to the process of scientific reason. First, get to where you understand the single layer model in Petty’s chapter 6. It isn’t at all precise or realistic, but it is sufficient for you to understand that interpolating any sort of absorptive layer between an open system — an externally heated object and the cold bath into which the heat eventually flows — will increase the dynamic equilibrium temperature of the heated object. That alone eliminates all of the handwaving, and allows you to start concentrating on actual numbers and models knowing that the misnamed “greenhouse effect” is real, is responsible for the Earth being (on average) warmer than it would be without an atmosphere or with an IR-transparent atmosphere, and that in the specific case of the 70% ocean-covered Earth with its complex atmosphere, tilted axis, eccentric orbit, and so on it is not simple, certainly not as simple as any linearization at the level of a single layer model, possibly not computable even with multiple layers and the smallest cells we can afford to cover the Earth with these days. That leaves lots of room to argue, but not about the existence of the effect itself, and most definitely not about whether or not a “trace gas” can produce a substantial shift in probable equilibrium temperature or play a key role in the Earth’s climate system. To save money, I was thinking more along the lines of putting the slab in the middle of a grid of shallow (but increasing height) walls designed to inhibit the flow of air over the surrounding terrain and break up convective rolls of a larger size than the object. Shallow to avoid occluding the sky. But sure, one could also put a vaccum directly over the slab, covered with a window that was perfectly IR-transparent — if one could come up with a window that was perfectly IR-transparent. A vacuum would eliminate conduction as well, and I’m all for that. Basically, the idea is to make the object an insulated “blackbody” that can only lose heat via radiation, in only one direction, to the extent possible, so that one can eventually resolve the modulation of radiation losses in that direction due to CO_2 concentration increases. One could probably even manage this in a lab setting. That is, one could (I expect) actually build a lab-scale experiment that would permit the warming of a heated object, or the slowing of the cooling of a passive object (relative to a provided, fixed temperature perfect absorber “bath”) due to an interpolated layer with a variable CO_2 concentration to be observed. What I don’t understand, given all the money that’s been thrown into making crap demos like Nye’s (and other crap demos I’ve seen online), is why nobody does this right. Give me a couple of hundred thousand dollars for materials, salary, and lab monkeys (I mean “graduate students”) to do the work of setting it up and hell, I’ll do it even though I’m a theorist, not an experimentalist. Demonstrating Willis’s “steel greenhouse” model, or equivalently the single layer model with a fully absorptive intermediate layer, would actually be easy and reasonably cheap. Demonstrating the warming due to a partially absorptive intermediate CO_2 would actually be much more difficult (you’d have to work with both vacuum and an intermediate gas layer, and would really need the IR-transparent window capable of withstanding vacuum against an atmosphere and access to very cold temperatures e.g. liquid helium to simulate 3 K “outer space” as the cold reservoir, although one might be able to use Nick’s scaling argument above and somewhat warmer cold bath temperatures to get a lab result that “in principle” might scale to get within an order of magnitude of the right result for the actual atmosphere. The hard part there is getting the shunt resistances — the processes like convection and conduction and latent heat transport that won’t easily fit into a single layer lab experiment — even close to right. On a loosely-related note, Bill Nye graces the cover of the latest Popular Science magazine with the caption “Bill Nye Will Save Science in America – or Go Down Swinging”…. I heartily second Dr. Brown’s comment. My sell-by date is too imminent for me to waste time on Mr. Stokes’ irrelevancies or Mr. Mosher’s inscrutabilities, and it’s annoying to see them ramify through others’ responses. Thanks. I don’t have the background to judge whether the no-feedback figures universally almost universally relied on really should be, but I’m not at all sure that actual experimental results would not be at least a little surprising. I stand corrected. Computer modeler who has studied other topics, granted. My hero RGB says I should quit banging, so I shall. Would you care to assess my comments concerning the validity of Nye’s procedure? If so, why did you not already do this? Perhaps you’d like to tell us about your scientific qualifications? Bill is already educating my students. I show the Storm/El Nino video every year to demonstrate how wrong a person can be when discussing ENSO processes. First I teach them basic geophysics of Earth’s rotation mechanics, show how we on the Earth view the trade winds as blowing from East to West relative to the Earth (ground Earth spins fast, air Earth lags), and then I show the video segment. Those that catch the error get an A. When viewed from God’s chair, yeh things are a bit different. But what matters is what we experience on Earth in terms of trade wind East to West weather and climate effects. You may want to read up a bit about how the James Webb Space Telescope will be tested before it is launched. It took very expensive modifications to an existing vacuum chamber at Johnson Space Flight Center (Houston, second largest vacuum chamber in the USA). This chamber was originally designed to test the Apollo capsules and is listed as a “National Civil Engineering Landmark” (I may have the exact designation slightly incorrect, sorry). In summary, it was necessary to build a large liquid He shroud INSIDE a large liquid N2 shroud to get the payload down to the necessary temperatures. Pumping the chamber down to “hard vacuum” levels is the easy part, establishing the “3K background temperature” is quite expensive, figure on about a million dollars a day for the He and the N2 and the energy to run the pumps, etc. Maybe you can talk them into “injecting” a whee little bit of CO2 to test the “greenhouse effect” hypothesis while they are at it ???? Am I dense or not, is not the so called atmospheric green house affect not the direct heat of CO2 from the sun but from the warn earth at night? Is that not true? If it is both experiments are monumentally wrong. To duplicate atmospheric CO2 induced warming one would need a radiating body to conduct the experiment correctly. The radiating body would need to be something that is warm as or near the same temperature of the earth and of similar matter as the earth so that is would radiates in a spectrum similar if not the same as the earth at night. Sorry a lamp of any kind does not make it. I believe both experiments are invalid to begin with. Yes, “chills the CO2” meaning its temperature decreased. To what level? Cooler than ambient? No. Start with gas at ambient temperature of 25C and 1 bar. Now compress to 2 bars at equal volume. Temperature rises. Reverse the adiabatic process. Lower pressure to 1.5 bar. Temperature decreases. Is it higher or lower than 25C? Higher. The result will be different if the system interacts with its surrounding such as poor heat insulation resulting to big heat loss. The process is no longer adiabatic and reversible. CO2 will warm slower than air because its molar heat capacity is 28 J/K whereas air (N2 and O2) is 21 J/K. If you reduce CO2 to 400 ppm, your glass jar must be at least 4 meters tall to have a chance of detecting “greenhouse effect.” Four meters is approx. the full IR absorption length by CO2 at 400 ppm. This was what I was thinking (and apparently impartial experiments have shown). If I’m not mistaken this would mean that CO2’s primary warming effect would be limited to reducing cooling. In ‘lay’ terms the CO2 acts like a capacitor for heat, with the molecules remaining excited for longer before releasing residual heat (err… cooling down). That should mean that so long as night time temperatures can reach their ‘optimum low’ (the same temperature they would hit with, say, 300PPM) that AGW by means of CO2 is falsified. Designing an experiment around this seems to be a much more simple endeavor with many factors not requiring an accounting. Multiple identical boxes each with different concentrations of air/CO2/Ar, etc… all within close proximity to each other and simply watch what a few days of normal weather does the temperatures in the boxes relative to each other. I honestly don’t know what the results would be. We wouldn’t need anything special but boxes carefully designed to try and not interfere with the natural processes being studied that can remain air tight with multiple shielded thermometers within each box. I’ve been thinking about this experience off-and-on again for quite a few months and it may soon be the case that I will have the means (time, skill, & location) to pull it off myself. Any ideas on material choices and layout? I think that the experiment is limited by using equipment that is readily available in a secondary school. The observation that it is not easy to show the atmospheric greenhouse effect (if any) is difficult to undertake should be sympathetically understood. The main point is that some attempts seem valid but use flawed physics and can be ruled out. I refer you to the work of Hoyt C Hottel on radiant heat transmission from nonluminous gases such as CO2 and water vapour.He developed smoothed plots of CO2 and water vapour emissivities at a total pressure of 1 atm, based on direct measurements of total emission. For CO2 emissivity depends on gas temperature Tg, the product term PcL (CO2 partial pressure and mean beam length) and the total pressure.Similarly for water vapour the gas emissivity depends on gas emperature, concentration and distance. This work is set out in Heat Transmission by WH McAdams 3rd ed chapter 4 and is widely used is design calculations for industrial furnaces. Sure! I have numerous patents on products that have generated millions of dollars in profits for my employers. My designs have broken new ground in several different industries: personal protective equipment (gas masks, rubber gloves), sports equipment (racquets), and the automotive industry. BSE in Mechanical Engineering, University of Michigan, 1981, not the highest rated school in this discipline, still only second behind MIT where my dad went. You seem reluctant to attempt to answer direct questions. Once again, could you assess my criticisms of Nye’s procedure? Nye is a mechanical engineer as well, but has gone over to the dark side, choosing to conform to the Team’s contentions rather than remaining rigorous to his training. Concerning radiative physics, my class in Transport of Heat and Mass, as well as standard ME Thermo and Circuit Analysis, gave me a background, and I have read extensively to understand what CO2 can and cannot do in the atmosphere. It seems to me that Trenberth’s 342 W/m2 from CO2 at the tropopause could not possibly heat Earth’s surface, as it would be absorbed and thermalized many thousands of feet above. Care to reflect? The paper itself is a bit critical of the Tobin paper, but I just can’t figure out why. They raise the same concern as Nick Stokes that the thermometer in the original paper is placed at the bottom of the vessel so it had no choice but to measure the convective effects, but I really have no idea why, because they placed many thermometers at places all over their apparatus at various heights and locations with respect to external lab features (on the side of the box toward the wall, away from the wall, etc.) and as far as I can tell from the data they’ve plotted the measured change in temps are smaller at the top of the vessel than they are at the bottom (which makes sense for many reasons) but the *relative* changes in temperature are essentially the same. They use three instead of two gasses, argon (mass 40), carbon dioxide (mass 44), and nitrous oxide (mass 44), and what they find is that the argon/air delta in their setup conditions is about 2.64C, which they attribute to a purely convective contribution, and the deltas for carbon dioxide and nitrous oxide are both approximately 0.25C higher, which they attribute to a purely radiative absorption effect. As I said, they are critical (thus “critical review”) of the earlier experiment, but I really have no idea why. They say that a careful experiment can separate the convective and radiative effects and the original authors were too dismissive of this as a lab demonstration possibility. But the original authors in fact clearly state that the difference in the two is over an order of magnitude different (0.25C is an order of magnitude lower than 2.64C the last time I checked) so isn’t a credible experiment to easily establish the greenhouse effect in a simple Gore/Nye-like demonstration. Taken at face value the results obtain in the new paper are perfectly consistent with and support rather than refute the original paper. In my opinion, or a paper that tried to show up the original and come running to the rescue of shoebox greenhouse effect demonstrations it did a poor job and left more questions than answers. I cannot find a non-paywalled version, but if anyone can so all the others can look it would be VERY helpful. The key figure I’ll describe is a temporal plot where they turn the light source on over an air-filled box and plot the temperature as a function of time to show it come to equilibrium. Then after equilibrium is established they dump argon from a room-thermalized container into the test container, presumably filling the test container with pure argon which then re-thermalizes under the lamp. As in the original experiment an easily observed spike in temperature occurs and is measured. Then, after peaking, the temperature starts to go back down because the test box is open at the top and the argon slowly diffuses out of the box to eventually result in a box filled once again with air and back at (or near) the original equilibrium point. After equilibrium is observed they then dump a room-thermalized container of carbon dioxide into the box and repeat the same temporal measurement and finally once the box is presumably just room-equilibrated air again they repeat with nitrous oxide. They talk about multiple experimental repeats and statistical analysis of the results, but they miss what to me is the big elephant in the middle of their plot. Lacking actual numbers and only looking at the plot itself it is very evident that the time from argon addition to peak argon temp is 2/3 that of the same measurement for carbon dioxide and nitrous oxide and the time from peak temp back down to equilibrium for argon is again about 2/3 that of carbon dioxide and nitrous oxide. There is absolutely nothing magical about the radiative effects present in the polyatomic gasses that can explain that. The argon goes up much faster and comes down much faster. There are two very obvious effects that would contribute to this observation. One is that argon has a mass of 40 and the other gasses have a mass of 44. So the diffusion rate of argon based on mass alone is about 5% faster than the mass-based diffusion rate of the polyatomic gasses. What that means is that argon is disappearing from the vessel measureably faster and the total integrated heat that argon’s convective behavior in the container contributes to heat trapping is more than a bit lower than in the cases of the polyatomic molecules. In fact, the 5% higher diffusion rate of argon could easily result in more than a 5% integrated difference in trapped heat (remember, the measured difference is only 10%) and the small dipole of nitrous oxide and the relative strong Van der Walls forces present in carbon dioxide and nitrous oxide might also help make up that total difference by decreasing he diffusion rate of these gasses even more. I’m not suggesting there is *no* radiative effect due to the IR absorption lines of carbon dioxide and nitrous oxide, but I think that this paper clearly makes the case it is directly measure to be more than an order of magnitude below the convective effect – INDEPENDENT of where the thermometer is placed in the container – and a careful examination of results and experimental conditions suggests the radiative effect is possibly even quite a bit smaller than reported. You know what I’d have loved to see in this paper? The same measurement but with krypton. I’m still getting my head around the claim that a CO2 concentration of 400 ppm (or 0.0004) will cause ever increasing temperatures. And yet here we are at 400ppm and temperatures have not increased for 17 years and counting. That’s a total headscratcher for the honest scientist. Argon gas warmed faster than CO2 and N2O because its molar heat capacity is less than half of the latter two gases. Ar = 12.5 J/K vs. CO2 and N2O = 28 J/K. Convective heat transfer will take place if the container is open, exposed to air. In closed container, it’s radiative and conductive heat transfers. Unless the container is as big as a room, it will have convective currents inside. The ‘back radiation’ is 324 W/m^2 not 342. You’re right, it is absorbed actually in just several meters. But it is re-emitted and re-absorbed continuously until it reaches the surface. It also reaches space since it travels in both directions, up and down. BTW I’m impressed with your credentials. I’m not a climate scientist but climate scientists seem to think I know enough about science. Today I got an invitation to review a climate change paper by a group of IPCC scientists. It’s unusual for a ‘denier’ to be doing this. I’m thinking whether to accept or decline. ‘Back radiation’ is a misnomer. Radiative heat transfer is the net result of an interchange between two ‘bodies’. The net result for interchange between gas containing CO2 and water vapour and its bounding surface is Q/A = sigma*(eg*Tg^4-ag1T1^4). The net transfer depends on the fourth power temperature difference between gas and surface (Tg^4-T1^4); which will be negative ie no ‘back radiation’ as T1 > Tg for land surface T1 and troposphere Tg. Radiative heat transmission is computed as a net transfer between two emitter/absorbers; magnitude depends on Stefan- Boltzman fourth power difference equation with heat flowing from the hotter to the colder body. This includes band emissions and total spectrum emissions. Irrelevant when speaking of actual processes rather than the macro-scale view point. Colder objects STILL emit radiation. That radiation STILL interacts with warmer objects. Therefore, radiation from cold to hot is still occurring – no matter of the given fact that the warmer body will be emitting greater radiation in most (all?) cases. I think a highly radioactive colder body could warm a warmer low radioactive body, but I have no evidence to support this hypothesis. It may require a very minute quantity or special circumstance, but I believe it to be possible. We know that cold bodies radiate, all bodies above absolute zero radiate and the emissive power W depends on its temperature only: W = sigmaT^4 (Stefan Boltzman Law). I wonder if I will ever find “back-scatter” in a physics book? Probably not. the warm object has no idea neither does it care where its heat came from, thus there is no “front” and no “back”. There is only radiation (scatter). Well yes, if ambient is NOT absorbing 20 micron but your sample gas IS absorbing 20 micron, then depending on how much 20 micron is actually present you will obtain a temperature differential, all other things being equal. Of course, all other things usually aren’t equal but there you go. Well, okay, true enough, but not as it is seems to be used climatism. Backscatter is not re-radiation. CO2 absorbs infrared, presumably heats up slightly, and emits a photon of its own, possibly or probably at a different wavelength, after holding the energy for a small amount of time. It might also convect its heat (and appears to be the principle mode). My comment expressly remarked on a CO2 molecule NOT knowing or caring where its energy came from — there can be no “back” when the molecule has no concept of direction. When it is ready, it will emit a photon. Backscatter is a reflection phenomenon, not an absorption phenomenon. Clouds probably backscatter AND absorb (followed by convection and radiation). Well anybody who thinks that the kind of apparatus used in these Bill NYE type of experiments are quite immune to pseudo BB radiation effects from to 1,000 to 3,000 K sources used, has rocks in their head. Take the flasks for example. Just what kind of glass are they made out of ?? Any ordinary (battleship plate) glass is almost certain to have plenty of water in it. Yes I do mean in the glass itself. Consequently, almost any ordinary glass, is strongly absorbing in the 1micron region. Get out your Edmunds Scientific catalog and look for the transmissions for some common optical glasses; like BK-7 for example. You have to know where to look, if you want a glass that doesn’t have the water dip in the IR transmission. Why do you suppose your house or car windows get hot,. So IMHO, the Nyescam is simply the vessel getting hot, and the thermal conductivity of the air mixture, being different. And if you don’t get convection in your jar, please photograph it, and make accurate dimensional drawings of your whole system; and send them to me. I have clients, who will pay almost anything to get any sort of illumination system, that is a perfectly uniform radiation beam. You don’t even need to get your hands dirty, with specific heats or molecular weights. First of all, you need to get two identical systems, to heat the same, before changing one of them. Air will transfer heat faster. Warms faster. The light-heat source must be at the bottom of the closed jar to get convection. If gas at top is warmer than gas at bottom, no convection. Hot gas will not rise because it is already on top. In small closed containers, the temperature difference of gas inside is small so convection is negligible. You presumably haven’t seen the paper and the data, so it’s difficult to draw conclusions from what you haven’t seen and what I can only strive, imperfectly, to clearly describe in text. You are correct in pointing out that argon has a much lower heat capacity than the other gasses, but it doesn’t influence the observations I described. What happens in the experiment is this: the apparatus is at equilibrium with air in it, at a temperature that, importantly, is above the ambient temperature in the room. The gas which is being introduced is at thermal equilibrium with the room, not the apparatus, before it is added. What that means is that, necessarily, the temperature of the apparatus briefly declines when the test gas is added. But the thermal mass of the gas is so small compared to the apparatus itself (not at all surprising) the data as presented show no decrease in measured temperature. That is, the temporal resolution of the data as presented (it was taken at 2 Hz, so they have it, they just display decimated data) shows absolutely no dip. The heat capacity of the gas would have it’s greatest effect in how far this temperature drop occurs and how fast the drop is reversed. The observed rise in temperature, because the thermal mass of the apparatus is so many orders of magnitude greater than the thermal mass of any of the gasses contained in the apparatus, is impacted by the heat capacity of the gas almost negligibly. And, even if the heat capacity of the argon describes why the argon temperature rise peaks faster (the heat capacity plays a minor, not major, role here) it absolutely does NOT explain why that temperature spike then returns back to the ambient temperature of the air-filled apparatus so much faster for argon that for the other gasses. The only thing that explains that observation is that the argon has to be leaving the apparatus much faster (i.e., observational timescale) than the other gasses. Therefore the time integration of the convective effect, which everyone agrees is the major player in the temperature rise, is much less for the argon than it is for the other gasses. And the difference between the amount of “extra” heat captured by the apparatus for argon and the other gasses doesn’t just automatically get placed in the radiative greenhouse column on the ledger sheet. 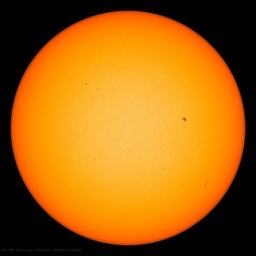 As an aside, all of the arguments that are being made about how this experiment has to be run with a 288K, or whatever temperature, blackbody are, to borrow a phrase, “not even wrong.” That is in itself a valid experiment, but it isn’t an experiment that tests the so-called greenhouse effect (so-called because of the many earlier discussions in which we all agree that greenhouses generally work not on the radiative properties of the glass walls, but on the fact that the glass prevents gas convection). That test which employs an *internal* heat source only would be a test of the *insulative* effects of various gasses – due to mechanical and thermodynamic properties of the gasses as well as any potentially active spectral modes in the relevant regions of the IR. The effect that the Nye-like experiments are trying to demonstrate is how incoming energy, in the form of primarily visible light (like from the Sun) are converted to heat by the “ground” and how gasses between the “ground” and the visible light source then, to varying degrees, *radiatively* interact with the “ground” to affect the equilibrium temperature. The problem related with the light source is really more along the lines that there is one heck of a lot more IR, relatively, in the source spectrum of a light bulb than there is at the bottom of the Earth’s atmosphere coming from the Sun and that the container also interacts with the light source in those parts of the spectrum in ways that don’t accurately reflect the Sun-Earth-Atmosphere system. Those are valid points to make in a critical analysis of the experimental setup, but removing the visible light source from the experiment doesn’t “fix” those problems, it makes the experiment a different experiment altogether that doesn’t tell us anything useful about the so-called greenhouse effect and the overall impact of greenhouse gasses in the Earth’s atmosphere. Then why are they using heat lamps? Seems a more proper experiment would be to use a low-IR light source shining into a container with a thick layer of dirt on the bottom and then compare temperatures over time. As it stands, the heat lamps are just heating the glass (which then gets hot) thus convecting heat into the gas contained therein (as well as some spectrally irrelevant radiance effects), thus providing no useful information what-so-ever other than specific heat comparisons. It is a completely useless experiment for trying to show the GHG effect of CO2. To do that one would need a much larger volume, a proper (diffused, spectrally accurate) photon source, and the container’s influence minimized. Five containers of an identical atmosphere. Same humidity, nitrogen, oxygen, etc… Remove all CO2 from all containers. All containers are placed in yet another master container to isolate external effects. This outer container contains either no atmosphere or an inert atmosphere and has a homogenous temperature. Note: Each container will have a non-heated control duplicate (so 10 containers total), 5 are for testing. On the bottom of each container will be placed uniform gravel, six inches thick, perfectly level. Next, silica sand will be evenly distributed over the gravel (the sand would be 1 inch thick on a perfect surface), followed by twice as much purified soil (by loose volume). After this the relative humidity in each container will be raised to 100% and the containers atmospheres will be intermixed and deprived of most or all of its CO2 via whatever means available. The air returning to the containers must be sterilized and kept at a relatively stable 288k, as well as reducing the humidity to normal-earth levels (global average). This process should continue for long after the majority of atmospheric CO2 has been removed – until soil moisture in all containers is equalized and the atmospheric analog contains the appropriate water vapor levels. 1.0 bar must be maintained throughout this process. It is now time to differentiate the containers by adding CO2 into the containers in pairs. One pair is already (0PPM – or as close as it gets) and it sealed. The remaining containers’ atmospheres are intermixed during the entire time when they are trying to reach their CO2 concentrations to distribute any errors evenly (such as a trace impurity). The second pair (200PPM) is sealed and the remainder keep gaining CO2 (while maintaining 1.0bar, temperature, and humidity) and sealing off once they hit their target concentrations. The containers are left to rest in a dark, homogenous environment, maintained at 288k with a controlled atmosphere and tested for proper isolation after a few days (all containers should show the same temperatures in pairs in the very least). Finally, the testing can begin. Now, heating should occur for 12 hours on, 12 hours off. Heating should be PURELY by the same spectra of radiation as seen in the lower troposphere. The control containers are shielded from the direct influence of this radiation, but remain in the same isolating atmosphere. During the experiment it should not be known which containers contain what concentrations of CO2 nor which container is relaying information to the control center (double blind) and the experiment should be able to run unattended for a few MONTHS. Sensors and cameras will monitor all factors of interest (absorption spectra, temperature, humidity, pressure, convection, condensation, and many atmospheric qualities). On the note of temperatures, we need to know more than just one or two. We need to know the actual temperatures of every layer in the containers, including the temperatures of the gravel, sand, and soil. From this, we can calculate how much energy has been stored in the containers. My guess is, with 12 hour cycles, there will be no significant net difference after about 400PPM. The walls of the containers will convect the heat to the 288k buffer fully over night (the walls don’t need to be specially insulated, that is the purpose of the homogenized common external buffering atmosphere held at 288k). All that needs to happen for CO2-induced warming to be proven is that the temperatures in the containers cannot reach the same thermal equilibrium as their lower-CO2 counterparts overnight because CO2 keeps the energy trapped – or that the higher CO2-containing containers heat up more during each and every day. My expectation is that the extra CO2 slows down the heating process, delaying the point at which the greatest temp is reached, and increasing nighttime temperatures until equilibrium is reestablished. At some point CO2 should be able to prevent nighttime temperatures from reaching equilibrium – and that will equate to thermal runaway, but I think the atmosphere would no longer be breathable by that point. I just realized I have a better way of explaining why heat capacity is not the issue in what the data show in the Eur. J. Phys. paper. In this case, the heat capacity of the gas would primarily influence the *rate* at which the temperature rises in the vessel. This also would eventually impact the equilibrium temperature of the vessel, but the experimental data show that the *rates* of temperature increase are, within the ability to intuit from the figure, essentially the same for all of the gasses. And this is consistent with the fact that it is not the gas itself that is being raised but the apparatus as a whole, and the rest of the apparatus has a MUCH higher thermal mass that any of the gasses so the thermal mass of the gasses is a minor effect at best. What is *different* between the gasses is the amount of *time* that the temperature increases and the amount of time that the temperature decreases, coupled with the fact that the apparatus never comes even remotely close to equilibrium again until all the gas is gone (i.e., the apparatus is back to air-filled). That’s a detail that may not have been clear and again points out the difficulty of fully and completely describing with words what is best seen with the eye. So, to be clear, the argon as well as the carbon dioxide and nitrous oxide all leave the vessel LONG before anything close to a new “greenhouse” equilibrium is established. The only thing approximating equilibrium that the apparatus ever experiences is when the gas is air in the container. So, because the gas residence time is *short* compared to the intrinsic time needed to measure the new equilibrium state the total amount of time the gas stays in the vessel is at least as critical as every other property of the gas. 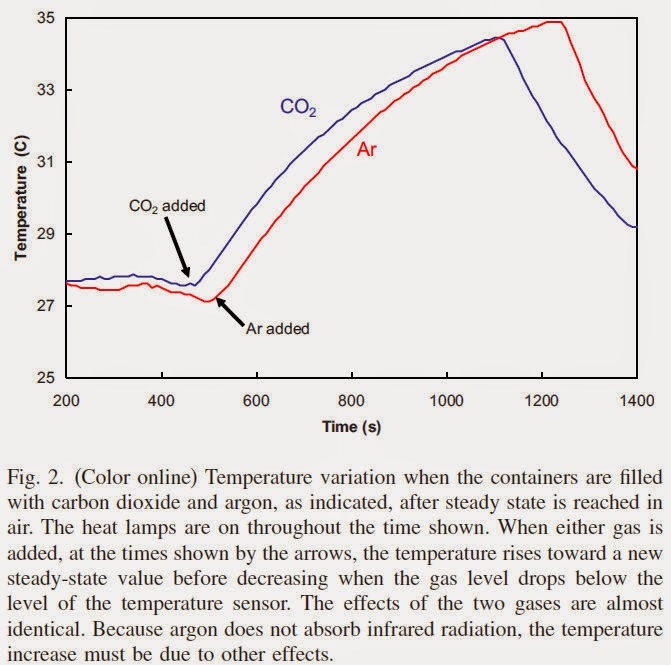 And the residence time of the argon in the vessel, as the figure clearly shows, is at least 10% less than the residence time of the other gasses, probable more, so a temperature increase of argon that is at least 90% that of carbon dioxide and nitrous oxide suggests that the less than but almost 10% contribution to the radiative effects of the IR gasses is almost certainly an invalid conclusion. I’m going to try to send Anthony a copy of the paper to see if he thinks posting just this figure is within Fair Use so everyone can see what I think the problem is with this paper and why, indirectly, it in fact strongly bolsters the argument that measuring the radiative effect of gasses in this way is very difficult. The equilibrium temperature difference (and the rate at which it is approached) occurs when the heat escaping balances the incoming power. Assuming that the incoming power is constant (which I doubt), the rate of escape depends on the thermal resistance between the heated body and the surroundings. Thermal resistance has (in these circumstances) three components: diffusive conduction, radiation, and convection. These work in parallel across any one interface, and in series between the heated object and the gas, across the gas, and between the gas and the container/surroundings. Conduction in gases is low, the thermal resistance is high. A blanket works by stopping air moving so that only conduction is left as a transport mechanism. Radiation depends on the difference in fourth powers of the temperature of the object and its surroundings. The surroundings are at nearly the same temperature as the object – the experiment is usually done in a warm room rather than open to the cold sky – and the small difference between the temperature of the room and the temperature of the gas warmed by radiation is small. In addition, the thickness of CO2 in a small bottle is tiny, compared to that of the full depth of the atmosphere, and even at 100% the CO2 is too thin to provide much of a barrier. The third effect, convection, tends to dominate. Not only because the thermal resistance is much, much lower, but also because it is non-linear. Increases in radiative or diffusive resistance tend to be cancelled by a drop in convective resistance, that takes up the slack. The thermodynamic properties of gases differ. Air and CO2 have different densities, specific heat capacities, viscosities, and thermal conductivities. The heat has to conduct across the static boundary layer into the bulk of the gas where it can convect, it has to convect to the top of the jar, and then it has to cross another static boundary layer into the jar (or the gas has to leak out of the jar through the cracks). The different physical properties of the gases affect all these processes. If you want to avoid all the arguments about how much radiation CO2 absorbs at what wavelengths, there’s a very easy answer. Instead of using CO2, just use liquid water. It’s a lot cheaper, easier to manage, easier to see what’s going on, is transparent to visible light, and incredibly absorptive to thermal infra-red. It’s about 20,000 times more powerful a greenhouse agent than air. Simply stick your thermometer in a jar of water and shine your light on it, and the radiated heat from it will be blocked from escaping entirely. Where you need metres of CO2 to have an effect, about 20 microns of liquid water will do. Why muck about with marginal, difficult-to-detect effects? Why not go for the most easily available material with the most extreme case of the property you’re looking for? You’re after something transparent to visible light and that absorbs and re-emits thermal infra-red, and water’s got that in spades. 20,000 times the effect ought to make the experimental procedure really easy. I have not seen the experimental set-up. I just rely on your description of it. If the Argon gas is cooler than the air inside jar, the experiment is flawed from the start. There is no control because gas and air are at different temperatures. Obviously we cannot accurately replicate the atmospheric greenhouse effect in a jar. The best these lab experiments can do is detect LWIR absorption by CO2. It has been done long ago with more sophisticated equipment. Nye-like crude experiments are just for the entertainment of hobbyists. I wouldn’t say that the argon gas being cooler than the air inside the container invalidates the experiment. It just defines a different starting point for the experiment. All of the gasses are introduced at that similarly cooler temperature with respect to the container upon introduction. True, as you point out, the argon should heat faster because it has a lower heat capacity, but the heat capacity of all the gasses is substantially less than the heat capacity of the container, so this impact, while absolutely present, is a minor effector of the results that needs to be noted but it doesn’t invalidate the results. In going over the paper again, the small difference in heating between carbon dioxide and nitrous oxide does seem to suggest they have accurately measured the radiative component, which clearly is at least an order of magnitude lower than the convective component, so this experiment really isn’t, as everyone has agreed, a way to demonstrate the radiative “greenhouse” effect in a simple classroom experiment. And, as Anthony said, Bill Nye is still not even wrong. The term photon can be misleading when used in general discussions as it implies something that is constant and unchanging when it is really a packet of energy whose magnitude depends on the frequency of the emitted radiation. Short wave or gamma rdiation gives rise to high energy photons as opposed to infra red or long wave radiation producing lower energy photons. Black body radiation comprises photons from across the spectrum but are they discreet and what distinguishes one quantum of energy from its neighbour. For instance a photon of frequency f1 with energy h*f1 has a neighbour with energy h*(f1+df1); how large is df1 is it f1*0.1 or f1*0.000001. In classical physics it was assumed that energy was taken up continuously which gave rise to the ultra violet catastrophe in physics during the late 19th C. Plancks Law solved this telling us that energy can only be taken up in discreet packets or quanta with each quantum having energy of h*f. Since h is a constant how large is the frequency ‘quantum’ or change between one photon and its neighbour? I for one don’t know but constantly remind myself that the term photon should be qualified by referring to it as a frequency photon or wavelength photon in discussions otherwise its significance can soon be lost.